Start off your visit on the 17th (Tue): contemplate the long history of Gurudwara Bangla Sahib, then contemplate the long history of India Gate, then admire the natural beauty at Humayun's Tomb, and finally wander the streets of Hauz Khas Village. 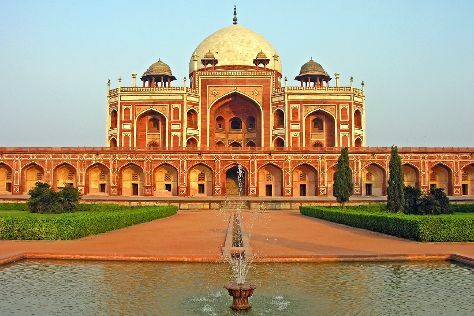 Find out how to plan New Delhi trip without stress by asking Inspirock to help create an itinerary. The Route module can give you travel options from your home to New Delhi. Expect a daytime high around 43°C in April, and nighttime lows around 25°C. Finish your sightseeing early on the 18th (Wed) so you can drive to Agra. On the 18th (Wed), don't miss a visit to Agra Fort and then don't miss a visit to Taj Mahal. On your second day here, look for gifts at The Warehouse of Gifts & Souvenirs, then take in the exciting artwork at Taj Gallery, then examine the collection at Spiritual Museum, and finally soothe aching muscles at some of the top local wellness centers. To find more things to do, maps, photos, and more tourist information, go to the Agra trip planner. You can drive from New Delhi to Agra in 3 hours. Alternatively, you can take a train; or take a bus. In April, plan for daily highs up to 44°C, and evening lows to 24°C. Wrap up your sightseeing on the 20th (Fri) early enough to travel to Amritsar. On the 20th (Fri), take in the spiritual surroundings of Hanuman Temple, take in nature's colorful creations at Jallianwala Bagh, and then don't miss a visit to Harmandir Sahib. On the 21st (Sat), you'll have a packed day of sightseeing: savor the flavors at Food & Drink, look for gifts at Raunak Punjabi Jutti, then make a trip to Khalsa College, and finally contemplate the long history of Gobindgarh Fort. To find ratings, other places to visit, photos, and tourist information, read our Amritsar trip planning tool . You can do a combination of train and flight from Agra to Amritsar in 5 hours. Other options are to drive; or take a train. 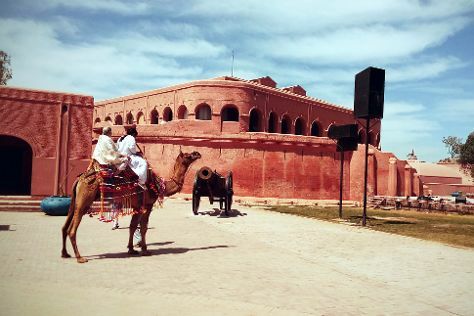 Traveling from Agra in April, things will get little chillier in Amritsar: highs are around 39°C and lows about 19°C. Finish up your sightseeing early on the 21st (Sat) so you can travel back home.